As tensions rise between Russia and Ukraine, 211 new immigrants from Ukraine will land tomorrow at Ben Gurion Airport. While skirmishes spark along the Russian-Ukrainian border, and pro-Russia seperatists wage guerilla warfare in Ukrainian Crimea (with the open backing of Russian troops), Ukrainian Jewry looks to Israel for safety and a home. On Tuesday, August 30, 211 new immigrants ("olim") from Ukraine will land at Ben Gurion Airport. 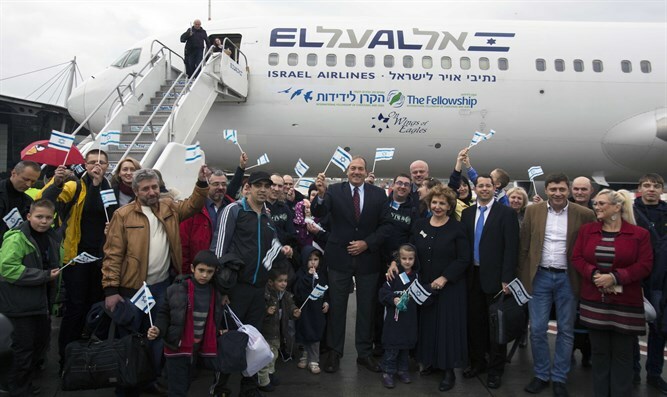 The olim will arrive in Israel on a flight organized by the International Fellowship of Christians and Jews (IFCJ). IFCJ has facilitated the aliyah of some 4,000 Ukrainian Jews since the start of the Russian-Ukrainian hostilities. The new olim are coming not a moment too soon: With Israel poised to start its new school year, some 50 children of the aliyah flight have already been enrolled in the Israeli school system, as their first step towards integrating into their new life in the State of Israel.